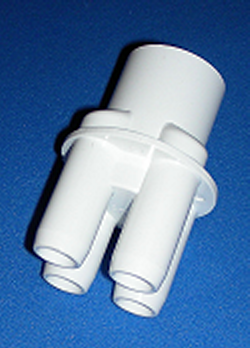 This page contains both smooth and ribbed barb distributor PVC pipe fittings. "Ribbed barbs" meaning they have the ridges to help hold the hose to the barb. However, some PVC pipe distributors have a "smooth barb" which has no ridges. They are easier to take the hose on and off and if you need such a feature be sure to look for them. We differentiate them with "RB" for "Ribbed Barbs" and "SM" for "Smooth Barbs." Feed manifolds and distributors with PVC Pipe (rigid or flexible) and distribute via Clear Braided PVC hose by the foot or Clear PVC Tubing. Manifolds and distributors with 3/8" SMOOTH BARBS will also work with 1/2" John Guest Polyethylene Tubing by slipping the 1/2" PE tubing directly over the 3/8" barbs because 1/2" PE tubing is 3/8" ID. You can also use a 3/8" JG fitting (couple, elbow, wye, etc.) that will go over 3/8" smooth barbs so you can then connect 3/8" PE tubing via the JG Fitting.